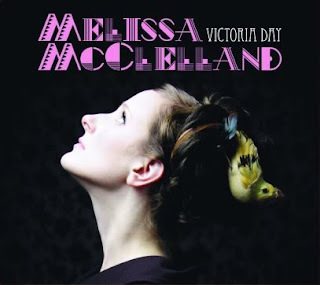 Blasphemy and vengeance — the kind that fuel small-town rumors of late-night dalliances and other illicit delights — yield to love among the ruins on Victoria Day, the latest album by singer/songwriter Melissa McClelland. Rich with folk, gospel, and blues, the songs on Victoria Day underscore searing, often-bittersweet yarns with the Gothic austerity of a murder ballad. Her voice gorgeous in its winsome grace, McClelland is at turns womanly and whip-smart, with an air of stone-cold defiance coursing through even her most self-incriminating admissions. “I have sinned, I’ve been around,” she concedes on “A Girl Can Dream,” a rockabilly rant of repentance and wishful thinking. She serves up a comparable shot of sass (hold the guilt) with “I Blame You,” a frisky rhythm underscoring her playful reproach. She’s a picturesque storyteller, populating otherwise barren ground with a cast of shady characters. To the raunchy, gin-soaked riff that drives “When the Lights Went Off in Hogtown,” McClelland renders a slice of backwoods nightlife behind closed doors — or at least away from anyone who’d judge — in lines like, “Now the smart girls just got pretty/And they’re not going home tonight.” Likewise, she laces a refrain of blessed reassurance in “God Loves Me” with scenes that aren’t exactly righteous. Exceptional from start to finish, Victoria Day is a masterwork.